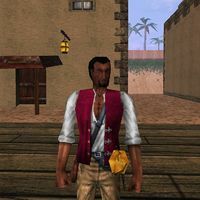 Cyrus is a Redguard mercenary and the game's protagonist. His journey to Stros M'Kai began when he received a letter from Tobias, his old captain, about his sister Iszara's disappearance. "Not bad. Try this one." This page was last modified on 15 August 2018, at 05:18.